Established in 1881, Convent of the Sacred Heart is New York City’s oldest independent school for girls and part of a worldwide network of over 150 schools committed to the education of the whole child, addressing her intellectual, spiritual, social, and emotional development. Since the 1980s, Convent of the Sacred Heart has experienced tremendous growth and academic progress. Enrollment currently stands at 670 young women from pre-kindergarten through grade 12. In September 2014, Convent of the Sacred Heart unveiled its new Athletics and Wellness Center at 406 East 91st Street. The main focal point is the 3,400 sq. 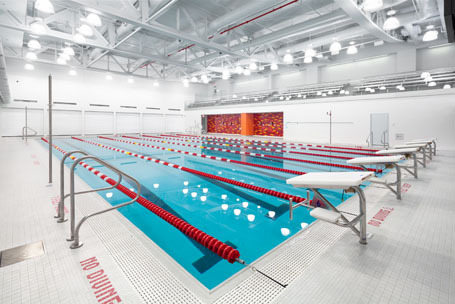 ft. swimming pool which features six lap lanes and is one of only three independent schools in Manhattan with a pool. The pool mezzanine can accommodate seating for 132 people. The large windows were designed to bring maximum natural light into the space without getting into the swimmers’ eyes. The pool mezzanine is housed on the second floor, where the administrative offices are located, in addition to staff locker rooms. A host of sustainable design strategies support the center’s operations as well as the health and comfort of its users. Solar hot water panels, a cooling tower supplied through rooftop retention tanks, high performance windows, and a pool dehumidification heat recovery system all contribute to comfortable air and water temperatures while minimizing the consumption of nonrenewable resources. Automated lighting controls, low-flow plumbing fixtures, and high efficiency mechanical equipment further reduce the environmental impact of the athletics center, a building type with traditionally high resource needs. Consequently, the project is on target to achieve LEED Gold certification.